Starring: Daisy Ridley, Mark Hamill, Adam Driver, Domhnall Gleeson, Gwendoline Christie, Carrie Fisher, John Boyega, and more. Another year, another Star Wars. Here we are with my review on Episode 8, ‘Star Wars: The Last Jedi’. What do we know? We get the next story involving our new heroes Rey, Finn, and company as well as our resident moody villain, Kylo Ren. We get a Rian Johnson directed and written Star Wars, after the announcement that he will be manning the next trilogy for the legendary series. Lastly, we know that there is quite a large amount of hype following the film as is the case for every Star Wars film. Personally, I think this is the most excited I have been leading up to a new Star Wars film compared to Rogue One and The Force Awakens following trailer views. So let us get to it… Another highly anticipated Star Wars, another Oberrated review! There is no denying it, I really enjoyed ‘Star Wars: The Last Jedi’. Overall, it was an entertaining and compelling experience and to be honest, my favorite Star Wars film of the three newest films. Most everything felt just right when blending my favorite Star Wars action, powerful and intricate characters old and new, and lastly my favorite layered story lines that keep me invested and curious from start to finish. This rough summary of elements are the core reason for my enjoyment of this installment of Star Wars. As always, I want to keep everything as spoiler-free as possible so to honor that desire, continue reading for some spoiler-free highlights and lowlights and/or click HERE for my spoiler review. Easily, my favorite aspect of this Star Wars film are the characters. Coming off of episode 7, I have voiced my appreciation of our new heroes, Finn and Rey as well as the villains (primarily Kylo despite his flashes of emo pre-teen angst). Going in and finishing my viewing of ‘The Last Jedi’ further solidified my adoration of these characters as I learned more about them as well as simply seeing them in action. Rey (Daisy Ridley) is a character I absolutely love and am excited to see continue as the flagship character for this era of Star Wars. Right next to her is a villain that is further growing on me, Kylo Ren (Adam Driver). Following ‘The Force Awakens’, I was on the fence with Kylo. On one end, he is extremely powerful yet he has not even unlocked his true potential. Yet on the other end, we see a moody and tantrum-filled man-child. Now following ‘The Last Jedi’, the always conflicted Kylo solidifies himself as a many layered villain that I can get behind and support. Once again, this is a cast of characters I have grown to like more and more and I am excited to see this cast hopefully fulfill their potential with coming films. Okay, so you have heard the summarized glowing points without spoils for ‘The Last Jedi’. But do not think that this is a home run film. I have a number of gripes with the film, and one last time for you readers that are skimming carefully, THIS IS SPOILER FREE. In my review for ‘The Force Awakens’, my most disliked point of that film was the comedy. I said that it felt like jokes that I would expect out of our resident Marvel heroes but not from Star Wars. Well, this time around the jokes landed better for me as I did laugh and enjoy a number of them but there were far too many that felt out of place. This concept of ill-placed humor is something that has been affecting my overall reception of Marvel and now Star Wars films where there is a time and place for the comedy. Again, a lot of the jokes landed well and were placed well but then there are countless times were I was put off by the timing. While discussing the film with friends, I came to the realization of a trend in regards to my split negative/positive reception of certain moments within the film. It is a topic of being supportive of a concept yet being disappointed in the execution. To explain this further without spoilers, if you can not understand it already, this means that I like the idea of something happening but the way it was done and/or presented within the film did not sit well with me. For the spoiler explanation click HERE and seek out Concept Vs. Execution. Despite my criticisms, I heavily rely my ratings on how entertained I am by a film. When speaking on the topic of ‘Star Wars: The Last Jedi’, my entertainment meter sat pretty damn high. Again, when you mix these characters, most aspects of the story, and all of the action sequences, the film is a roller coaster of excitement. Fans old and new should find enjoyment in most aspects of the film but when taking some ill-timed comedy and questionable moments into consideration, it is easy to see where some can be turned off by the film if they see these points as enough of a glaring mark on their experience. Nonetheless, from my perspective, ‘Star Wars: The Last Jedi’ is yet another installment deserving a watch and debate-worthy conversations. Go out and enjoy, folks. 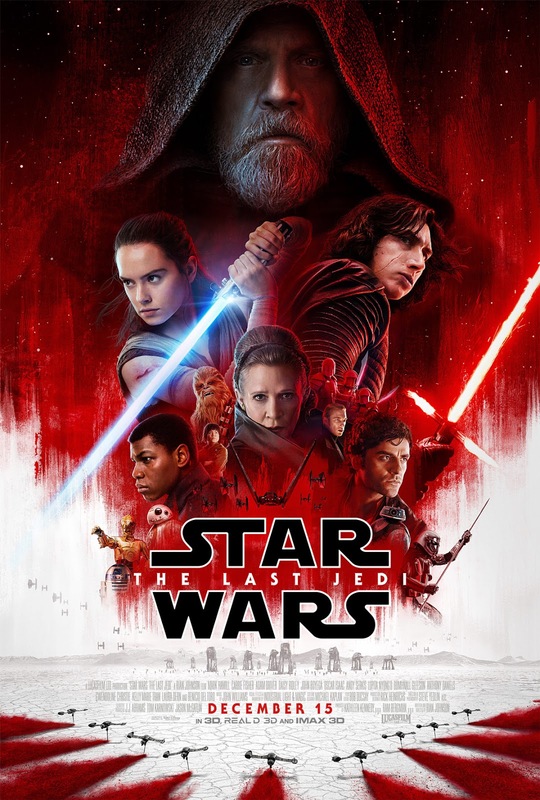 Posted in 2017 Movies, Movie Review.Tagged Adam Driver, Daisy Ridley, John Boyega, Kylo Ren, Rey, Rian Johnson, Star Wars, Star Wars The Last Jedi, The Last Jedi.